Teachers will be reminded of our embryological roots and their relevance to deepening practice. You will have confirmation of the power of subjective experience in relation to physiological systems and how this influences the guidance of students and their own inner exploration. You will learn how gravity, breath, sensory refinement and functional anatomy conspire to take you beyond and beneath habitual patterning and in so doing enrich and deepen your teaching skills. The Original Body brings together a variety of sources for yoga teachers to draw from. These include Reich, Lowen, Rolf, Conrad, Feldenkrais, Shwenck, and some of the essential principles of classical and cranial osteopathy. Above all, the teacher is continually invited to acknowledge the power, subtlety and the wealth of information residing within their own physiology. Introducing a way of moving that provides a powerful foundation for the practice of Yoga and acts as a practice in itself. It starts from the premise that ‘depth work’ underpins all styles of Yoga and Movement. The Original Body: Primal Movement for Yoga Teachers invites its reader to delve deeply into their body-mind and shows how bringing our original body to the foreground of awareness provides a powerful approach to personal growth and can be used as a springboard from which all practice and teaching can proceed. The Original Body introduces a primal movement experience and explains the rationale behind it. It focuses on physical exploration but its scope touches us on other levels, enhancing the quality of our behaviour and our way of relating to ourselves and others, as we discover that we can operate from a place of deep strength and soft power. The physiological focus of The Original Body is on ancient rhythms that are revealed by direct entry into the body-mind. The intention of the book is to draw out a deeper experience for teacher and student by enhancing the ability to ‘go into oneself’ and to use this as a primary foundation for teaching, thus deepening us and our skills. The Original Body reveals a profound mobile strength forming the basis for spontaneous expression and an alternative way of being, as we discover that all practices share common denominators and that we move from a common source. The author explains how THE ORIGINAL BODY reveals itself in the absence of methods and systems and invites a depth of feeling that predates ‘ideas’ around yoga. The personal experience of each individual practitioner holds the key for unlocking the true physiological nature as we pass through personal patterning and begin to move the same way. Yoga teachers are invited to work with bony, soft tissue, fluid and energetic sensations, and are constantly reminded that primal movement can only be uncovered by the personal inquiry and the sensory experience of the practitioner, and that this forms the basis for a profound approach to teaching. The Original Body suggests that the most effective group work is built on the inspiration led by the deeper practice of the teacher. This book provides an essential addition to the library all the teachers of yoga and movement. If yoga is the poetry of the body, this book is sheer poetry about the practice of doing yoga. It says it’s for yoga teachers, but really anyone who practices yoga or martial arts, as well as any form of bodywork or somatic therapy will be gratified to read this book. I ate it up, underlining and highlighting so many parts that I wanted to remember and bring to my teaching. It’s not an easy read — for it’s densely rich, and the many jewels want to be savored, thought about, and explored on the mat. If you suspect that the body is a gateway to realization, that being fully embodied is a life long exploration, not just a mass of muscles and movement, but of sensation and exquisite attention to the subtle, but profound presence of the life force, then this book is for you. And for genuine teachers of yoga, this book is a must. 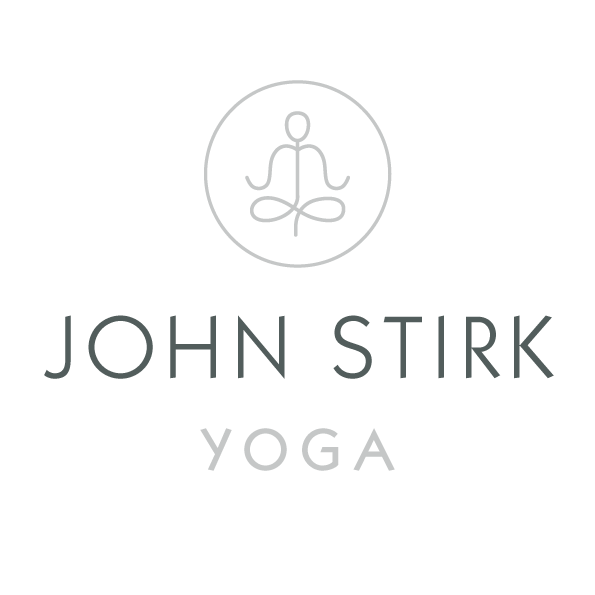 John Stirk has long been recognised an an outstanding yoga teacher whose work has been constantly developing and changing for over 30 years. His long-term curiosity and continuing work has resulted in this startlingly simple approach. His new book seems to me to be a potent distillation of years of work and does not stay focused on yoga in the traditional sense, but simplifies, strips away and looks beneath. Fascinating. This book makes the essence of yoga accessible. Its not a conventional book of yoga poses, “making shapes” but rather reintroduces you to a very primal way of moving and being in your body. There is a lot of philosophy, thoughts on what gets in the way of a more profound practice – when you get to chapter 16 you get practical instruction. The biggest problem might be the baggage we all carry if we have practiced for any length of time. If you can leave your baggage at the door this book is invaluable. The Original Body is a ‘must-read’ book for yoga teachers genuinely interested in rediscovering an authentic foundation for their personal practice and their teaching. As a long-standing yoga teacher and osteopath, Stirk has spent decades exploring primal aspects of the human body-mind and this text is a synthesis of many of his personal inquiries and experiences with students and clients. The Original Body posits that “there are ‘ancient’ ways of moving that underpin all other movements and postures and that these primal patterns can be tapped into as a spontaneous ‘now’ experience, not guided by previous personal experience or conditioning.” The ‘now’ experience is a meeting of sensations and feelings that cannot be held, captured or taught. The movement of the original body is the practice, practitioner and teacher. Throughout the book we are challenged to question many of the ways we have been taught move and practice yoga, ways that form our habitual somatic experiences. The author invites us to recognise that the functions of the neocortex, while often regarded as a hallmark of our evolved state, should not override the earlier and more primal functions of other brain structures such as the limbic system. While making good arguments for re-learning about our original body and its natural movements, Stirk’s language inspires and makes for enjoyable reading. For example, this gem resonated with me: “Let go of previous experience, be a guest of time. Time has no problem with itself because it is in time with itself. Remain receptive, as the sensations come towards you, do not know them. Give up a sense of owning the practice. Pass through personal relationship to what you feel. As we practice, attention to tissue sense invites a constant flow of sensation into consciousness. As sensitivity awakens, we devolve. Awareness retraces the evolutionary journey, from tissue to energy to space”. The Original Body is a book that is much needed in the yoga teaching community and in years to come will be regarded as an important, seminal text that helped reshaped yoga practice for the better, helping it to return to its origins, prior to lineage, branding or faddism. Richard Rosen – Yoga Teacher and Author – Berkeley, California USA. 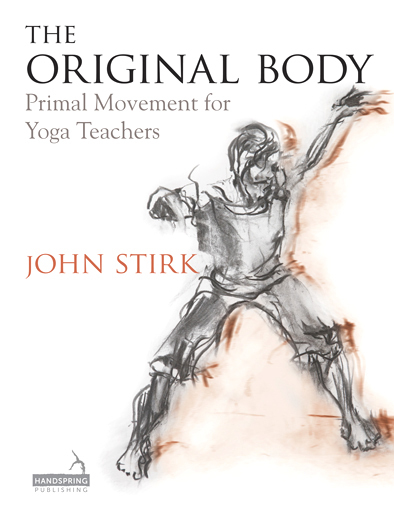 Stirk has influenced yoga students and teachers around the world for over forty years and now invites us to join him in his exploration of physical and primal movement in this remarkable book. Here ‘original’ means enquiry – a spontaneous investigative and deeply nurturing form of movement that moves away from the structural rules of alignment and sequencing that dominate modern yoga practice. Although primarily aimed at teachers and students of yoga, this book will fascinate and inspire anyone interested in breaking down boundaries – not just those that restrict movement and breath, but how we think, feel and develop our yoga practice. Stirk takes us back to an unfolding from the embryonic state, through the learning and development that can hinder our progress and our relationship with ourselves, others and the environment. With illustrations to enforce the science that supports his enquiry, leading to suggestions and images of the movements that will facilitate deeper enquiry, this book is for anyone who is open to potential and ready to question their teaching. Recommended.